During the recent decades the historical dimension of cognition, the role of memory and the framing in social and cultural history have gained ground. Philosophy, the human sciences and cultural history may ask different questions and use different tools and cognitive frames than the natural sciences, but nevertheless they contribute to the enlargement of ‘the horizon of lived human experience’. Needless to say, art history takes part in this endeavor. The use of the term ‘cognitive frame’ seems legitimate here as well. As for ‘description’ which is the issue here, two levels of cognition come to the fore: the function of perception, identification, and communication in the narrower sense, the lower level of pre-iconographical subject matter. The second ‘high level’ of cognition addressed here deals with the merging of form and content, also with reference to the prevailing cultural situation. In both cases, problems of semantics arise which will be discussed in the latter part of this paper. Hence, in the history of art descriptions refer to different cognitive frames. Moreover, the transformation of the impression of a painting into another media, from ‘a language centered epistemological programmed’ (Wittgenstein) to a description of an image, turns out to be a complex process. A certain inconsistency may also arise through flaws in verbalization. The frame in quest is manifold and can encompass technique, codes of representation, mimesis and likeness, symbolic significance, and even general cultural items. Paul de Man gauged the relation between image and text as incommensurable, but some art historians such as Mieke Bal have questioned boundaries between literary and visual analysis, following up the modalities of representation while ‘reading pictures’ in order to discover the strategies and meaning behind them. Notwithstanding the differences of the media, I still presume that all descriptions refer to cognitive frames, and so do images as well. Jacob Burckhardt once complained that in trying to describe a certain work of art the art historian can only encircle it. He never arrives at the heart of the matter, owing to the ineffable process of artistic transformation. This puzzling fact of creativity and mimesis, the making and matching, has been discussed at length by Gombrich, ultimately leaving the scholar baffled by the ‘wonder of simultaneity’. This seems to be confirmed by neurobiology. According to Wolf Singer, visual stimuli address mental faculties which are less related to discursive logic than to emotion and expression, situated in the pre-cortical structure of the brain. Maybe the use of metaphors in poetry does, after all, help to bridge the gap between the representation of objects and the poet ‘thinking in pictures’, using images as a means of literary expression. The winner of the Nobel prize in medicine in 2000, Eric Kandel, has devoted his life to brain research, the interaction between the unconscious, cognitive psychology, biology, and bioneurology, with special regard to the fundamental faculty of memory both in bioneurology and humanities, e. g. creativity and the arts. (Also Wolf Singer tried to bridge the gap in 1994 – cf. end note 5). Kandel’s book The Age of Insight from 2012 will probably become indispensable for a wider public reflecting upon creativity and communication and to those interested in the crossover of cognitive science and humanities. c) a means of approaching reality in a seemingly objective way rather than as a means of explanation and interpretation. These basics are also relevant with regard to aesthetics. The everyday function of description as identification through attribution with special regard to absent phenomena is very much the same in the realm of the visual arts. Panofsky speaks of the primary or natural subject matter and the act of interpretation, referring to it as a “pre-iconographical description”. The problem arising here is that even in the case of a plain description, the mode of representation is inextricably linked to convention and tradition, both from the artistic point of view and with regard to the spectator. Any kind of communication in everyday life presupposes a constant process of identification, a make-believe that encompasses the willingness of the recipient to succumb to illusion: listening to a narration or perceiving an object as appearing ‘real’ in a painting – the psychological readiness “to adjust the mental set” (Gombrich) in order to internalize the object described and its style can be defined as a process of identification in aesthetics as well. The process of identification and recognition discussed so far becomes even more complex if we turn to phenomenology and the distinctions made by Franz Brentano, Husserl, Merleau-Ponty, and others. The primary retention (in memory) signifies the immediate recognition or identification of a represented object. The secondary retention harks back to former experiences, actualized and represented as a whole, a recollection of contexts in the past (Husserl). A further distinction is made by Husserl as the primary recollection not only includes the identification of objects and persons but also the emotional response attached to them: the secondary recollection, on the other hand, not only represents a former mental situation but also distinguishes the present state of mind as distinct from the former content actualized. The consciousness of this ambivalence is addressed as Phantasiebewußtsein (“phantasy of mind”). Recollection in this wider sense is a sine qua non of creative reproduction, affecting the mind as a whole. This emergence in phenomenology may be traced back to Romanticism and even further, to processes in the mind as discussed by Locke and Hume. Later on, Coleridge in his Biographia Literaria (1817) dwells upon the distinction between Fancy and Imagination – the first defined as “Memory blended and modified by Choice”, the second as “Imagination dissolves, diffuses, dissipates, in order to recreate”. Fig. 1. John Constable, “Wivenhoe Park” (1816; detail). National Gallery, Washington. At this stage of the discussion we are dealing with the ordinary kind of memory, objects which are seen and experienced in representations but absent and therefore substituted by description. But here too it proves almost impossible to draw a clear line between an empirical object and experience detached from it – is there such a thing as an objective description? The stronger a verbal or illusionistic description, the more we are inclined to yield to the suggestiveness, the conjuring up of the representation. The painter in former times was regarded as a ‘magician’, a mediator between reality conjured up and the observer led astray by way of mimesis. 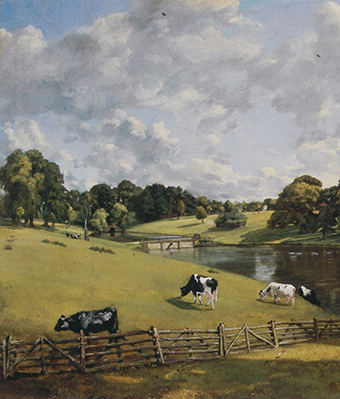 Is there a psychological difference between a vivid description by Thomas Hardy, as cited in Wolf’s introduction, and a painting by Constable (fig. 1)? As an analysis of descriptions shows, in most, if not in all, cases as their means are verbal, pictorial and even auditive, they transcend the state of mere reproductions. The components of most descriptions are chosen from a reservoir of memories, decomposed and then restored in a new construction of a world, referred to by Coleridge as ‘Imagination’. Thus, even life-like descriptions show elements of construction rather than of pure re-presentation: explanation and interpretation have little to do with it: –they rather counteract description as such. If, with regard to literary description, Riffaterre therefore speaks of its primary function as being “to dictate an interpretation”, the formal aspect of ‘how’ something is described becomes adumbrated. The analogue case of practical representation in the visual arts (the mode of execution, form, color, expressiveness, etc.) obviously does not play any part in the cited definition of a ‘meaningful construct’. In my opinion, the formal ‘meaning’ on the level of a pre-iconographical description or expression, and experience related to it respectively, is just what a painting is all about. Van Gogh, for instance, makes us ‘see something’: e. g. the pungent yellow or the power of ultramarine in his stunning “Wheat Field with Crows” (1890). The pre-iconographical description and the practical experience related to it deal with formal aspects and aesthetic appreciation, in some cases it coincides with Panofsky’s “intrinsic meaning” or “symbolical value” of a work of art within the general cultural context. With regard to still-life painting, for instance, the iconological question is not necessarily concerned with a specific meaning behind the motif in question but rather evaluating it as part of a genre within a general cultural context. Obviously, the strong demand for still-life paintings in 17th-century Dutch society provided the financial basis and means for a widespread specialization in this field of painting. The fundamental question as to whether a certain tradition of representation may lead to specific expectations, selective perception and widely accepted aesthetic norms, cannot be discussed here: it has been dealt with at length by Gombrich and others. 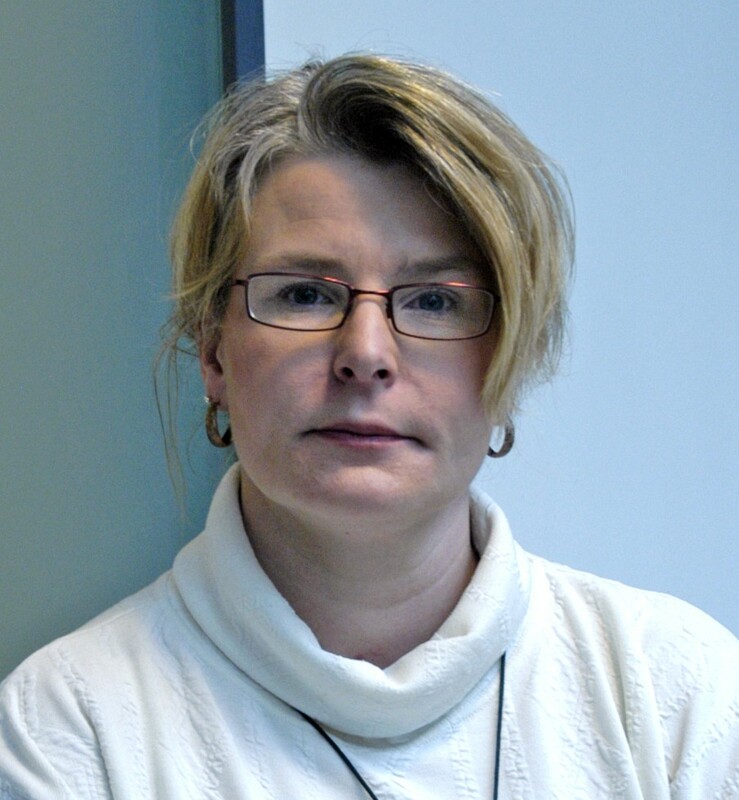 Svetlana Alpers has written an influential book with the challenging title The Art of Describing (1983), dealing with description as the essential impetus and aspect of Dutch painting and culture in the 17th century. Francis Bacon, Huygens, Kepler and Comenius were the champions of the empirical conquest of reality by way of the exact description of natural phenomena. The astronomer and the geographer, as portrayed by Vermeer in two famous paintings now in Paris and Frankfurt, by profession encompassed the field of natural sciences of the age: map-making was explicitly addressed as Descriptio mundi. The painter also held a prominent place in society as an expert in pictorial representation, here less concerned with mimetic description of things in nature and the surroundings, but rather as a depiction of the world seen from a cosmic angle above – an abstraction, but still the outcome of empirical investigations related to a highly complex cognitive frame. Jan Vermeer’s ‘The Painter in his Studio’ from 1665/1666 (fig. 2) may serve as a brilliant example of the thrust of Alpers’s argument. Fig. 2. Jan Vermeer, “The Painter in his Studio” (1665/1666). Kunsthistorisches Museum, Vienna. Description is not an end in itself, but nonetheless an indispensable means of communication, in the realm of art and aesthetics as well as with regard to cognition. In fact, Alpers and many scholars with her have paid attention to the spectacular map of the Netherlandish Provinces covering the wall in the background of our painting. With utmost precision Vermeer represents an actual map by Claes Jansz Visscher, of which one copy has been preserved in the Bibliothèque Nationale in Paris. The rendering of the northern and southern Dutch Provinces hints at past history, the country itself being the outcome of a long historical process with intimations of a lost past and the potential glory of a future society. Clio, the personification of History, stands between the painter and the map, which shows the art of mimetic description in its most prestigious form but, at the same time, exemplifies a highly complex abstraction. In fact, the word Descriptio on the upper border of the map denotes a geographical representation of the world, ending up in a conceptual kind of depiction. Many artists were certainly involved in the investigative conquest of the visual world with all its scientific, commercial, and political implications. So in fact we are confronted with an adequate realization of a cognitive scientific frame. As described by Cesare Ripa in his Iconologia 1604, Nr. 346, the woman with the attributes of laurel, a trumpet and a book has to be understood as an allegorical representation of history, i. e. Clio, but this interpretation is weakened in our case by her strong physical presence, the allegory brought back to life by acute observation and a phenomenal execution. Painting itself, the conjuring make believe, may be interpreted as a self-referential homage to the actual execution of the miraculous painting – a reconstruction of the intimate world of the studio, reflecting the everyday life of the busy painter, who, himself a part of the setting, is depicting his model’s laurel on the canvas and thus appears both as master and subject matter of the actual painting. Light becomes transformed into color, defining the objects and closing the gap between reality and the réaliser on the canvas, enhancing the visual quality of experience, leaving the spectator astounded by the strangeness of an interior at first glance classified as familiar. Description, as practiced by Vermeer, is not a mirror of the visible surrounding, but of the mind of the artist at work. This complex subject touches the core of artistic creativity: representing and transforming the world vu à travers un tempérament. The true subject of the painting – referring to cognition as a frame – is here located in the realm of otherness, reflecting the consciousness of a mind. The spectator stands at the threshold of a mental room which he perceives but will never enter. 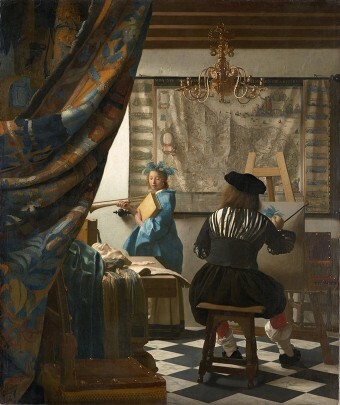 On the lateral borders of the map in the background of Vermeer’s painting we see a series of Dutch cities represented within the frames of the cartouches – actualizing the tradition of topographical description, which in Holland became a popular genre of painting itself, triggering a different cognitive frame. 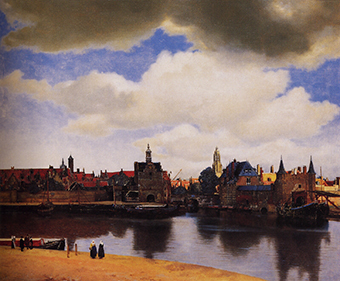 The depiction of authentic cityscapes reached its climax with Vermeer’s “View of Delft” (Mauritshuis, Den Haag, fig. 3). Fig. 3. Jan Vermeer, “View of Delft” (c. 1660). Mauritzhuis, The Hague. The distinction between the accurate topographical description on the verge of scientific documentation, making use of the camera obscura and other devices responding to demands of a cognitive kind, and the abstract description of the map on the other hand, is obviously the outcome of a difference in function and social expectations, the cognitive frame shifting from one position to another. Vermeer had no problem siding with both. The veduta in the eighteenth century can be gauged either way. Canaletto was held in high esteem, not only as an outstanding painter, but perhaps, and even more so, by the English gentry whose castles and the prestigious sites of their estates he depicted. The commissioners certainly focused primarily on the accuracy of the depiction, and it took the genius of Constable to escape from the straight-jacket of this demand. Mimesis – Mirror or Lamp? Vermeer is only one of many painters reflecting upon description and the vital role of mimesis in the process of artistic realization. The wish to conjure up by means of a perfect illusion has been a constant theme in literature and ekphrasis since antiquity as recorded by Pygmalion’s dream, the utopian quality notwithstanding. An interesting painting by Magritte has come down to us, showing the artist depicting his model, representing her as a real person in space, liberated from the canvas she would normally merge with (fig. 4). The paradoxical nature of miraculous fiction is commented upon in the title: “Attempting the Impossible”. Fig. 4. 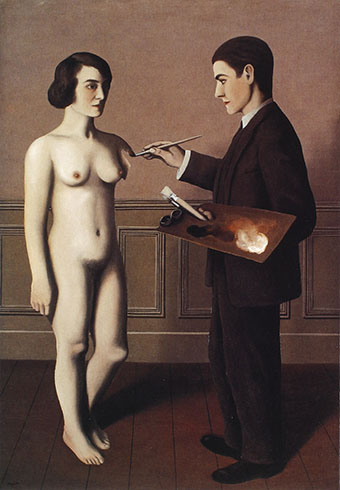 René Magritte, “Attempting the Impossible” (1928). Toyota Museum, Nagoya. So far, I have dwelt upon some aspects of the iconic manner of description, wavering between the representation of things, absent and unseen, and the encounter with the world as reflected in the artefact. The examples chosen make it clear that even description and identification of simple objects in pictures tell us plenty about the general conditions of the ages, promoting the choice of motifs and the mode of expression. Moreover, the micro-genres cannot be separated from the general frame, which differs in pictorial arts from the cognitive macro-mode aimed at by verbal description and communication. I will here discuss the arguments put forward by Wolf in his introductory statement on “descriptions in the pictorial medium (painting)”. The “typical class of signs”, at first envisaged, concerns the simple identification of “objects as static and spatial”. According to Wolf, a pictorial medium such as painting appears to have a very high descriptive potential, whereas the experience of its objects “requires only a relatively low degree of the recipients’ share […], since it permits the beholder to experience these objects in a way that is much closer to real-life perception than is the case, e. g., in written literature”. Fig. 5. 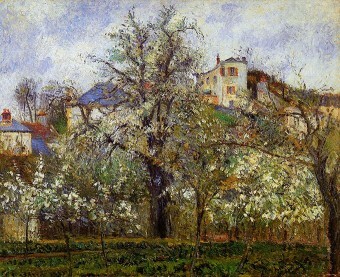 Camille Pissarro, “Gardenview from Pontoise” (1917). Louvre, Paris. While Wolf focuses on a comparison between pictorial and verbal media, one must emphasize that apart from the comparative focus it would be a simplification to relate painting only to perception. In fact, such a simplification would adumbrate the complexity of the matter from a neurological point of view and, moreover, would not do justice to the psychological processes involved in mimetic representations and their mental reproduction on the part of the beholder. When hearing the sentence, ‘the horse is rearing’, as well as when looking at a drawing that shows a rearing horse, the brain of the recipient is triggered and his mind starts reproducing the event hinted at and the circumstances related to it. The word is not moving, nor is the depiction, but they are experienced as dynamic triggers, suggesting movement. The function of description, be it in words or in an image, is referential. Confusing a depicted object, illusionistic and spatial as it may appear, with reality is less probable, ‘impossible’ as Magritte asserted. Fig. 6. Alexander Cozens, “Blot Nr. 11” (1785/1786). British Museum, London. I agree with Wolf that the amount of information stored by the depiction of a tree, in literature would require a never-ending, quite tiring ekphrasis – the simultaneity of iconic representation can conjure up an image which looks as diversified and rich as phenomena in nature (see fig. 5). But the process of making and matching (Gombrich) is regulated by norms and techniques related to the medium alone, the outcome of a longue durée and personal skill The readiness of the spectator to respond to lines and dots, to ‘read’ these codes as descriptions and references to real objects, is astonishing indeed, and bears witness to the brain’s capacity for a high degree of abstraction. The ‘beholder’s share’, consciously or not, is always operating at this level. The dynamics of perception and their visual counterparts have been scrutinized for a long time, especially by Arnheim with regard to the visual arts, and mental projection itself has been reflected upon even long before. The ‘blottings’ by Alexander Cozens may serve as an example (fig. 6). Fig. 7. Wassily Kandinsky, “Composition IV” (1911). Kunstsammlung Nordrhein-Westfalen, Düsseldorf. Wolf has formulated the provocative question of whether ‘there are any pictures at all that are not descriptive’. Of course, all mimetic pictures are descriptive in a simple way, (e. g., on a low-level range of cognition), notwithstanding the fact that they consist of abstract, codified microsigns, put together in order to represent a certain motif. The pull of illusion indeed has proved to be strong enough to serve as a common denominator in the visual arts for about 800 years. Kandinsky stands at the end of this development, and his own artistic career bears witness to the struggle for liberation while eliminating mimesis. 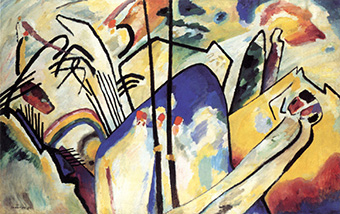 Yet in “Composition IV” from 1911, referred to by Wolf as an example of abstraction, there are still traces of mountains, towers (the ‘Kremlin’), riders, horses, battles, couples – lines and clusters of color, intimating a world pervaded by a ‘sounding cosmos’, standing at the brink of autonomy and self-referentiality – lines, colors and volumes, indexical traces of emotional response (fig. 7). Modern art is directed towards the world within, an emerging structure and harmony hitherto unseen and unheard of, coming into being: a revelation born out of the artist’s mind. Less of a description, it is true, but rather a divination of a spiritual kind, as stated by Kandinsky himself in his book Über das Geistige in der Kunst from 1911. Also the pittura metafisica aimed at the Great Spiritual ‘sub metaphoris corporalium’. Even if there is such a thing as ‘abstract art’, let us consider Mondrian as another representative, description does not completely disappear there either, being directed towards structure and energetic color fields, which, according to the artist, represent underlying principles in nature and the cosmos by way of analogy. The knowledge which arises in descriptions of abstract painting is not less complex as in the case of mimetic art. We may compare Jackson Pollock’s ‘gestural painting’ with Barnett Newman’s “Vir heroicus Sublimis” (1958/1959), which cannot be defined by a one-way reference to well-known motifs and concepts, but rather as a deictic (demonstrative) approximation toward expression, reflecting the state of the artist’s mind. Boehm has discussed the convergence of processual abstract art and ekphrasis with regard to the ‘deictic’ aspect, making the beholder see what has been brought to light. Fig. 8. Wolfgang Hollegha, untitled (c. 2001). Private Collection. 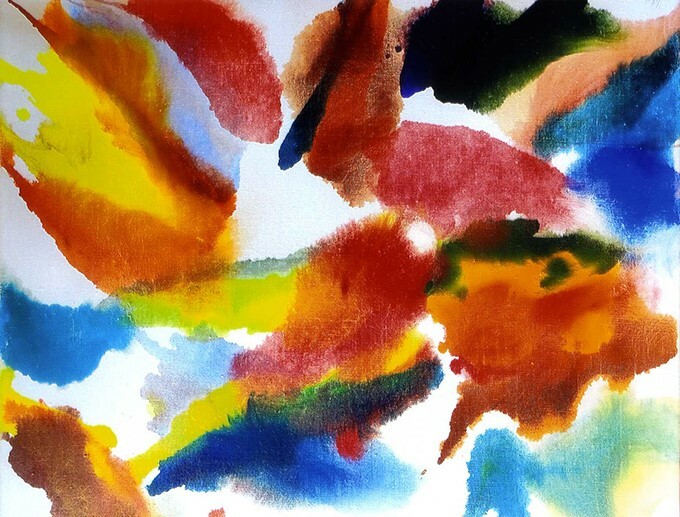 The Austrian painter Wolfgang Hollegha, promoted by Clement Greenberg in the late 1950s as one of the shooting stars, has developed a personal processual method of painting ever since: starting from an everyday object represented by swift explosive pencil drawings as an analogue movement characteristic of the motif, a spark setting imagination aflame. A gradual process of painting now ensues: splashes of pigments dripped and shed on the vast canvas on the floor, diluted, washed and blurred. Pollocks’s method of “drip painting” is now expanded to encompass sparkling color fields, interacting and merging and contrasting with each other during the process of realization into ever higher strata of abstraction (fig. 8). Depiction is here materialized as equivalent to imagination and the accompanying state of mind, reflecting nature as an echo from within. Painting triggers the active response of the subject, partaking in the dynamic, generative forces of nature, brought into being by the artefact. Hollegha explicitly takes side with the standpoint of Heidegger, Merleau-Ponty, and Wittgenstein, rejecting the claim of heuristic objectivity and defending emotional response and the necessity of ‘being engaged’ in the visual world. The implication of subjectivity has been discussed by Charles Taylor with regard to the philosophers mentioned. As for the painting of Wolfgang Hollegha, what at first sight seems to be a pure abstraction, always stems from an object observed. The gradual creative process of painting is guided by self-referential inner forces of necessity. Description at the end strives to visualize the inner state of the mind, turning the ongoing “morphology of feeling”, as Susanne K. Langer would have put it, into dynamic forms and orchestrated colors. The outcome may be characterized as a visual equivalent of the “morphology of feeling”, an emotional response. Fig. 9. Giotto, “Flight into Egypt” (1305). Scrovegni Chapel, Padova. Wolf rightly speaks of a minimum of representationality required to evoke illusion and narrativity in visual art. Giotto’s fresco of the “Flight into Egypt” in the Scrovegni Chapel in Padua (about 1305 A.D.), is referred to as an example of a “schematic, low-degree landscape description” (fig 9). It is true, mountain forests were certainly “not among the main interests of [the] painter”. But on the other hand, an application of our standards of illusion may prove fallacious. As spectators we have the possibility and ability to ‘adjust our mental set’, as Gombrich puts it. Compared to fresco-painting in the late thirteenth century, Giotto certainly embarked on an illusionistic adventure undreamt of before. At the same time, description as a means of illusion was never pushed beyond a certain point by the painter: it remained rather balanced and even reduced, due to other artistic considerations. Mother and infant, riding on the donkey, occupy the center of the square, according to Arnheim, the least dynamic position of an object on a plane, intimating stability and certainty. The group is further stabilized by the mountain peak looming in the background. 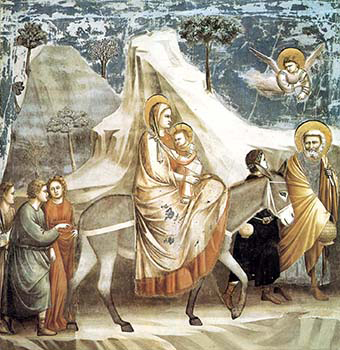 At the same time, Giotto had to represent a passing moment – the donkey and the other protagonists ‘move’ across the picture plane from left to right. The position of the lines and the torsion of the bodies, not to speak of the foreshortened angel showing the way, certainly strengthen this effect. Later on Wolf concedes “a particularly large share of the recipients’ imaginary activity” while experiencing movement in bodies. The effect of transitoriness is further enhanced by the depiction of the companion just entering the picture on the left, or the contour of Joseph overlapped by the framing border on the right. 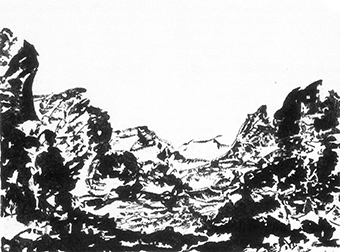 The impression of depth in space is evoked by the smaller and darker mountain to the left. The dominant sweeping contours of the mountains descending diagonally from left to right enhance the forward pull of the group, especially accentuated by the right arm of Joseph who is about to vanish out of sight. The position of the tree-trunks, stabilizing verticals or slight diagonals, also indicates both stasis and movement. A rising diagonal from left to right – the arm of the companion, the bridle and the neck of the donkey, culminating in Joseph’s head and shoulders – serves as a counterpoint, indicating the direction of the protagonists. All of this is effectuated within the square of the fresco, which never gives up its specific character being an iconic structure restricted to a plane. The indexical hints are incorporated into a calculated, apparently simple order which turns out to be highly complex. We are confronted with a deictic frame of formal organization, with an icon corresponding, by way of analogy, to the true subject matter: “The Flight to Egypt”, transitory, yet fixed. For these reasons I cannot see why paintings, as asserted by Wolf, should have “obvious limitations in realizing […] the temporal frame of representation par excellence, namely narratives”. Fig. 10. 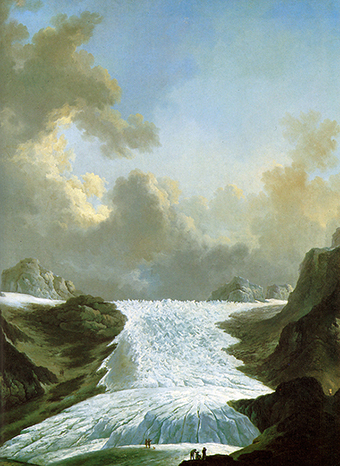 Johann Heinrich Wüest, “The Rhône Glacier when looking northeast” (1772/1773). Kunsthaus Zürich. Although restricted to the representation of single events and specific objects, references to the past or to the future within a narration are abundant also in the visual arts. Temporality, in fact, is a constitutive part of representation, mimetic and expressive, as well as of perception. The depiction of a story told in visual art may be called intermedial, but most of the stories themselves are related, in their turn, to conceptual frames of a more general kind. Bialostocki talks about general human topics as iconographical ‘framing themes’ (Rahmenthemen). As for religious motifs and biblical texts, these meta-frames serve as a sine qua non of any story told or represented, and the description or representation itself is, in the end, also related to the exegesis, or, in the profane context, to an interpretation and, quite frequently, an implicit moral lesson. Detailed information on single objects and constellations refers to concepts and events represented by visual objects, figures, signs and symbols. Description, thus, is not only restricted to the presentation and identification of the motifs enumerated. They serve as vehicles, i. e. references to a concept of a more general kind. Wolf´s analysis of Johann Heinrich Wüest’s “Rhône Glacier when looking north-east” from 1772/1773 serves as a good example (fig 10). Minute figures in the foreground reflect different attitudes and reactions in the observer himself. As he is caught by the overwhelming dimensions and the force of the scenery, the painting mediates awe, enjoyment of the spectacle, and the actual presence of the Sublime by the panorama represented. The tiny figures in the foreground are shown as if reacting to Nature. The referent, in their case, is not located in the landscape, but rather in the state of the beholder’s mind, revealed by gestures and the like. Whereas Edmund Burke stressed the physical conditioning of fear and terror triggered by the overwhelming panorama, Wüest seems to take sides with Diderot and Kant here, relegating the Sublime to the realm of psychology, e. g. self-consciousness. Even in this landscape painting, which is not primarily narrative, the motif itself and the minute figures represented suffice to draw attention to a conceptual frame reflecting a specific aesthetic experience. Fig. 11. 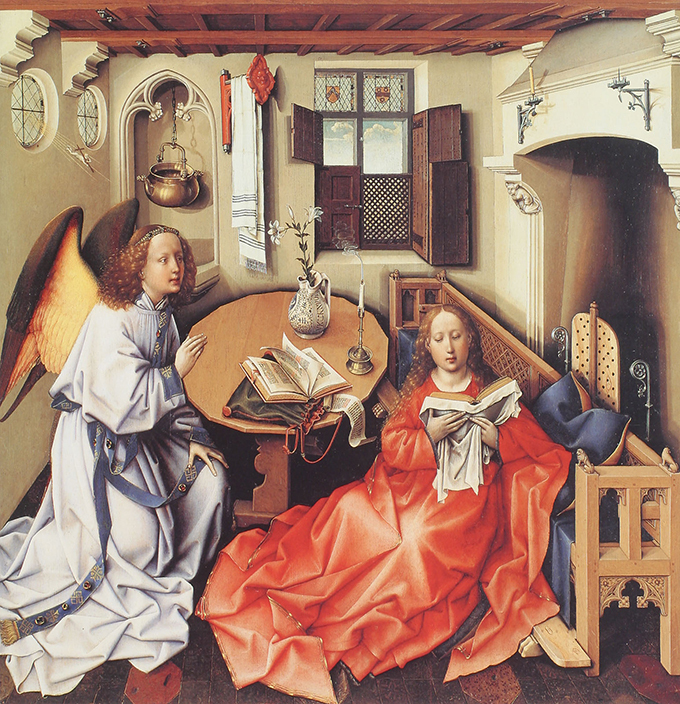 Robert Campin, “The Annunciation”, Mérode Altarpiece, (1425). Metropolitan Museum, Cloisters, New York. The analysis of Giotto’s “Flight into Egypt” dealt with the formal structure as related to the represented narrative and motion. The second layer of Panofsky’s iconology not only concerns the content of ‘images, stories and allegories’, but also the question of how a picture can refer to an action unfolding in time? Description here still serves as a reference to a conceptual frame. During some periods of cultural history there was a growing tendency to imbue single objects with a “symbolical meaning” – the locus classicus of Thomas Aquinas was deliberately chosen as the title of this paper: spiritualia sub metaphoris corporalium (Summa Theologica I, qu. I art. 9, c). The problem of ‘disguised symbolism’ (Panofsky), emerging in early Netherlandish painting, arises from the fact that the presumed ‘symbolical’ meaning, and consequently the referential function of objects minutely depicted and packed into a contemporary interior, is hard to distinguish. Iconographical tradition may help to clarify the significance. The Mérode Altarpiece by Robert Campin, about 1425 (fig. 11) here serves as an example: the pot with the lilies on the table refers to the chastity of the virgin, as do the laver and basin as substitutes for the ‘fountain of gardens’ and the ‘well of living waters’. The lions in the armrest of the bench refer to the Throne of Solomon (I. Kings x, 18 ff. ), a simile of the Madonna as Sedes Sapientiae. The candle on the table probably signifies Christ: Christus […] est candela accensa (Speculum Humanae Salvationis, chapter 10), though the extinction, according to Panofsky, could also refer to the notion of St. Bridget that the mother of the Lord by the radiance of Light Divine became “reduced to nothingness”. The referent (e. g. the cognitive frame), made visible by description, elucidates the meaning of the scenery as a whole: the purity of the Virgin. Turning once more to the Mérode altarpiece, which represents the crucial event of the Annunciation, we are certainly confronted with a narrative subject. The extensive research devoted to this painting has progressed ever since Schapiro and Panofsky. Which moment of the event was chosen? Has the angel already announced the message to the Virgin still reading in her breviary? The tiny infant carrying the cross, just intruding through the circular window to the left, was normally accompanied by the dove of the Holy Ghost. Has he already reached his goal? The sumptuous codex on the table was identified by Châtelet as the Exposition by Ludolph of Saxony on The Life of the Virgin. Ludolph, in another text, describes the descent of the Holy Ghost on the occasion of the Pentecost in terms of a blowing wind. According to Bonaventura in his Lignum vitae (c. 1250), the Holy Ghost “came over her like a divine fire, inflaming her mind and sanctifying the flesh with the most perfect purity. Then the virtue of the most High was infused into her in order that she might be able to sustain such ardor.” We can thus conclude that the divine wind, or fire, has already passed, extinguishing the candle on the table in doing so. Patrik Reuterswärd drew attention to another indication of the occurrence: the parchment folios of the codex (also dealing with the subject) seem to have been curled up as if having been exposed to a great heat. Thus the previous stages of the narrative become indicated, and the incarnation itself is just about to take place. Needless to say, the verbal communication of a certain concept is more precise than depictions of objects and symbols in the visual arts. Even the symbolic meaning may cause uncertainty and debate there, the deictic function sometimes being more the outcome of an interpretation than a simple representation of an undisputed content with an intrinsic meaning. The semantic analysis of iconographic symbols has dealt with the uncertainties here involved. It is not the description of an object, a narrative or an abstract concept that is at stake here but rather the way a content or supposed meaning is transformed to the beholder. Semantic studies dealing with these problems emerged in the 1950s and the philosopher Göran Hermerén, has summed up this development. Distinction is made between conventional symbols based on rational agreement and natural symbols referring to a referent by way of a similarity or a causal relationship based on form or content. Semi-conventional symbols, moreover, may refer to abstract concepts based on a general agreement, or by way of a similarity between the object represented and an assumed significance familiar to the beholder. Iconographic symbols, according to Hermerén, merge with pictures or objects referring to an intrinsic meaning or an implicit concept, as is the case in a pragmatic illustration. Allusion effectuated by an iconographic symbol makes the beholder think of a certain content which is not directly represented. Three more referential types of symbols ensue: the opinion brought forward by the artist; the hidden symbol, the meaning of which is only distinguishable within a wider context; and allegories and respectively symbols. Allegories exemplify general concepts through figures or narratives: they always refer to a cognitive frame of abstract concepts and ideas. The genesis of a symbol, on the other hand, emerges from the object itself, the symbolic quality of which has been generally acknowledged and also corroborated by aesthetic experience. Tradition and convention with roots in Romanticism play a decisive role here. Subsequently Hermerén deals with the iconological interpretation of art, its content in relation to the prevailing cultural situation, aiming at a comprehensive Weltanschauung. This method was developed in cultural history and sociology by Karl Mannheim and applied to the history of art by Panofsky and others. 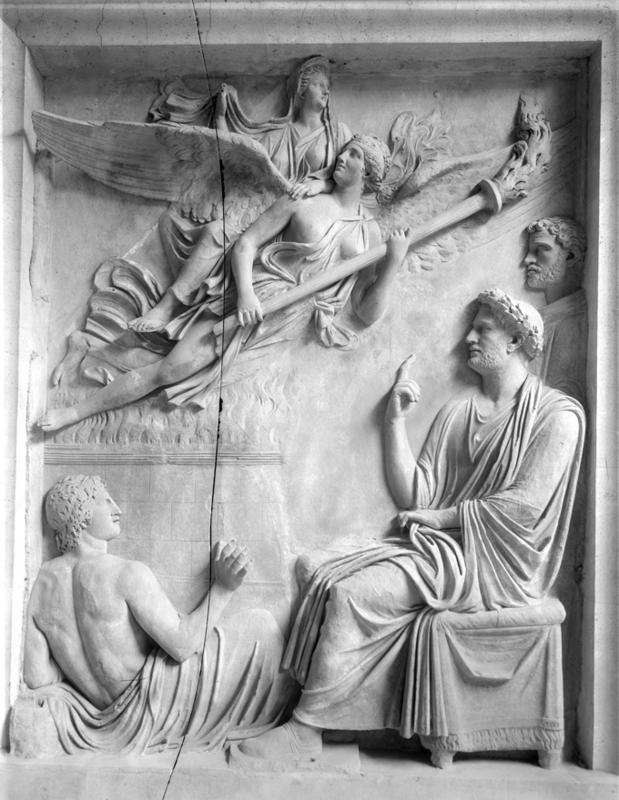 The third strata of “an intrinsic meaning or content, constituting the world of symbolical values”, remains accessible only by intuition born out the scholar’s acquaintance with the cultural situation as represented by the humanities, literature and the arts and the prevailing life style and Weltanschauung of the historical period in quest. A congruence between a work of art and the intrinsic meaning is hypothetically distinguished as an analogue structure or an identical Gestalt as a whole, discerned by intuition as the outcome of the underlying “spirit of the age”. The latter also encompasses the relation between the artefact, its originator, the impact on the beholder, the cultural context and tradition, and hence also the adhering description. The sociological field and the related interactions are also decisive factors in the interpretation of visual phenomena as the outcome of the hidden “third strata” of meaning. The symbolical interpretation and iconological description of an artwork can only, in the end, be corroborated by the scholar’s intuition and feeling. Notwithstanding the subjective flaws in the methods adhering to the general history of ideas, they cannot invalidate the higher aspiration of iconology as a constitutive part of cultural tradition. In 1877 the physicist Ludwig Boltzmann published a major work on thermodynamics, using statistics as a means of physical calculation. Many problems in physics still remain unsolved and even mysterious, as for instance phenomena in quantum mechanics, but in consequence the calculation of probabilities has become an indispensable method in cognitive sciences ever since in solving seemingly hopeless cases. This also goes for prognostics in sociology, economy, and politics. As we have seen, the iconologist also operates in a similar way in the field of cultural history. The description of a work of art and the interpretation applied may refer to a hypothetical cognitive frame or an unfathomable intrinsic meaning. Although the reference cannot attain certainty, the conclusions drawn by the scholar can claim a high grade of probability. The cognitive limitations of narration in the visual arts are compensated by a wide range of references, located in the past or in the future. Pictorial narrativity is endowed with a complexity which is different but as diversified as in verbal narratives. An apparently ‘realistic scene’ and single motifs are saturated with meaning, though we can never be sure to grasp them all, nor can we speak of the ‘one and only’ intention behind them. Pictorial representations, ambiguous as they may be with regard to narrativity and descriptivity, are, by their own means, no less suggestive and far-reaching than their verbal counterparts. Description as such is therefore – as well as narration – certainly a transmedial mode of representation, not restricted to verbal texts, or pictures for that matter. Götz Pochat, em. Professor. Karl-Franzens-University, Graz. Studies in Comparative Literature and History of Art at the University of Stockholm. Fil. lic 1968; fil. dr. 1973; fil. lic. 1974. Prof. in History of Art at the RWTH Aachen 1981–1987. Chair at the Institute of History of Art, Karl-Franzens-University, Graz 1987 – 2007. Fellow of the Warburg and Courtauld Institutes and Harvard University. Monographs on Exoticism 1970; Figure and Landscape 1973; The Concept of the Symbol 1977 and 1983; History of Aesthetics and Art Theory 1986; Theatre and Art 1990; Time in the Visual Arts I 1996; II 2004; III 2015; Zeit/Los (Time/Lot or less). The Story of Art and Time 1999; Masterpieces of Modern Styrian Art 2003; Art, Culture, Aesthetics. – Collected Essays 2009. * This article is a revised version of my contribution to the series 2007. Studies in Intermediality 2, Description in Literature and Other Media (Eds. Werner Wolf, Walter Bernhart), Amsterdam, New York 2007: Rodopi. Due thanks to Katharina Bantleon, Graz, who once managed layout and proof reading of all the SIM volumes, and now has helped me to trim this article into the required shape. The quotation in the caption stems from St Thomas Aquinas’ Summa Theologica I, qu. I art. 9 c. (“corporeal metaphors of spiritual things”). 1 Wolf, Werner 2007. Description as a Transmedial Mode of Representation: General Features and Possibilities of Realization in Painting, Fiction and Music. In Description in Literature and Other Media. Eds. Werner Wolf & Walter Bernhart. Amsterdam, New York: Rodopi, 1–87; The arbitrariness of meaning is discussed by Man, Paul de 1979. Allegories of Reading. Figural Language in Rousseau, Nietzsche, Rilke and Proust. New Haven: Yale University Press. 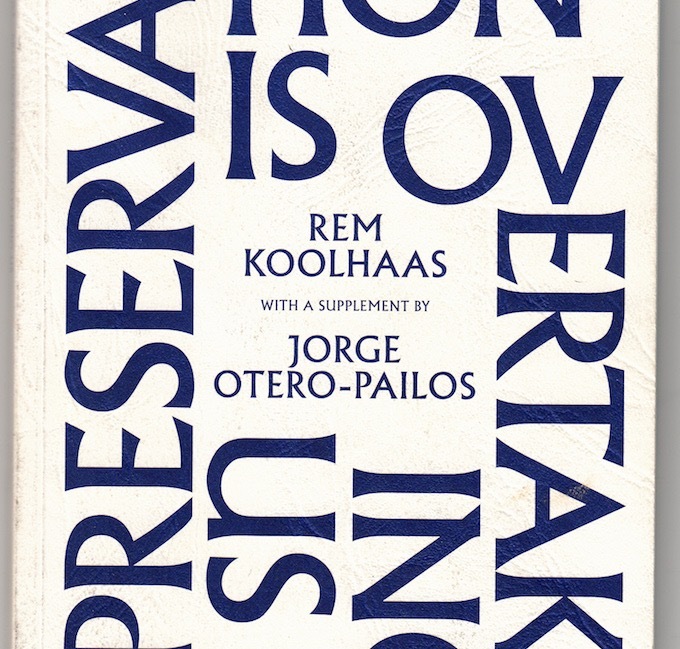 De Man brings the uncertainties of the metaphor compared to metonymy into focus; his role as a representative of demonstration in aesthetics has been summarized by Kern, Andrea 1998. Paul de Man. In Ästhetik und Kunstphilosophie von der Antike bis zur Gegenwart in Einzeldarstellungen. Eds. Julian Nida-Rümelin & Monika Betzler. Stuttgart: Kröner, 529–534. 2 Cognitive sciences deal with the processing of language; with learning as an innate, genetic endowment, or from empirical point of view, an ability learned from the environment; memory storing information short-term (perception, discourse) or long term as in the case of the natural or cultural sciences. A great deal of the ongoing research in ‘Relational Frame Theory’ is concerned with brain research by way of behavioral experiments, including imaging, cognitive symbolic and computational modelling. Since the late 1950ies, however, the limitation of behaviorism became obvious. Cognitive sciences expanded, especially with regard to neural networks and artificial intelligence (computation); cf. Cognitive science. Wikipedia. https://en.wikipedia.org/wiki/Cognitive_science (retrieved 25.03.2016) with an extensive list of references; The empirical experimental approach to cognitive framing in neurology may be exemplified by the following article: Barnes-Holmes, Dermot et al. 2004: Interfacing Relational Frame Theory with Cognitive Neuroscience: Semantic Priming, The Implicit Association Test, and Event Related Potentials. International Journal of Psychology and Psychological Therapy 4:2, 215–240. 3 Bal, Mieke 1991. Reading Rembrandt. Beyond the Word Image Opposition. Cambridge: Cambridge University Press. 4 Gombrich, Ernst H. 1968 (1960). Art and Illusion. A Study in the Psychology of Pictorial Representation. London: Phaidon. (Gombrich’s endeavor to bridge the gap between psychology, e. g. Gestalt-theory, neurology, and the visual arts is highly estimated by Eric Kandel). 5 Singer, Wolf 2002. Der Beobachter im Gehirn. Essays zur Hirnforschung. Frankfurt am Main: Suhrkamp. 6 Kandel, Eric 2012. The Age of Insight. The Quest to Understand the Unconscious in Art, Mind, and Brain from Vienna 1900 to the Present. New York: Random House; further Publications in quest: Roth, G. 1994. Das Gehirn und seine Wirklichkeit. Kognitive Neurologie und ihre philosophischen Konsequenzen. Frankfurt am Main: Suhrkamp; Damasio, A. R. 2014. Descartes’ Error. New York: Random House. 8 Panofsky, Erwin 1962 (1939). Introductory. In Studies in Iconology: Humanistic Themes in the Art of the Renaissance. New York, London: Harper & Row, 3–31. 9 Husserl, Edmund 1969. Zur Phänomenologie des inneren Zeitbewußtseins (1893–1917). Husserliana X. Ed. Rudolf Boehm. The Hague: Martinus Nijhoff; Merleau-Ponty, Maurice 1945. Phénomenologie de la perception. Paris; German version: Merleau-Ponty, Maurice 1966. Phänomenologie der Wahrnehmung. Berlin: de Gruyter; Keller, Wilhelm 1964. Die Zeit des Bewußtseins. In Das Zeitproblem im 20 Jahrhundert. Ed. Rudolf W. Meyer. Bern, Munich: Francke, 44–69; Gorsen, Peter 1966. Zur Phänomenologie des Bewusstseinsstroms: Bergson, Dilthey, Husserl, Simmel und die lebensphilosophischen Antinomien (= Abhandlungen zur Philosophie, Psychologie und Pädagogik, vol. 33). Bonn: Bouvier; Pochat, Götz 1984. Erlebniszeit und bildende Kunst. In Augenblick und Zeitpunkt. Studien zur Zeitstruktur und Zeitmetaphorik in Kunst und Wissenschaften. Eds. Christian W. Thomsen & Hans Holländer. Darmstadt: Wissenschaftliche Buchgesellschaft, 22–41; Pochat, Götz 1996. Bild/Zeit, vol. I, Zeitgestalt und Erzählstruktur in der bildenden Kunst von den Anfängen bis zur frühen Neuzeit. Vienna, Cologne, Weimar: Böhlau, 7–26. 11 Husserl 1969, 48; Pochat 1996, 15. 12 Coleridge, Samuel T. 1907 (1817). Biographia Literaria. Ed. John Shawcross. Oxford: Oxford University Press. 13 Kris, Ernst & Kurz, Otto 1980 (1934). Die Legende vom Künstler: Ein geschichtlicher Versuch. Frankfurt am Main: Suhrkamp. 15 Riffaterre, Michael 1981: Descriptive Imagery. In Yale French Studies 61. New Haven: Yale Univ. Press, 107–125. 16 Panofsky 1962, 7. Here one should also mention the widespread influence of Mannheim’s Weltanschauungslehre in cultural history und sociology: Mannheim, Karl 1923: Beiträge zur Theorie der Weltanschauungsinterpretation. In Jahrbuch für Kunstgeschichte, vol. I (XV) 7, 236–274; Rinofner-Kreidl, Sonja 2000. Freiheit und Rationalität. Ethische Implikationen der organischen Geschichtsphilosophie Karl Mannheims. In Einheit und Vielheit. Organologische Denkmodelle in der Moderne. Studien zur Moderne 11. Eds. Barbara Boisits & Sonja Rinofner-Kreidl. Vienna: Passagen Verlag, 179–224. A universal cognitive frame addressed as Zeitgeist, encompassing everything, cannot guarantee certainty. The iconologist can only trust the probability of his argument (cf. last section in this article: The semantic interpretation of symbols). 17 Alpers, Svetlana 1985. Kunst als Beschreibung: Holländische Malerei des 17. Jahrhunderts. Cologne: DuMont, 4–146. Original: Alpers, Svetlana 1983. The Art of Describing. Chicago: Chicago University Press. 18 Alpers 1985, 213; cf. also Sedlmayr, Hans 1959. Jan Vermeer: Der Ruhm der Malkunst. In Epochen und Werke. Gesammelte Schriften zur Kunstgeschichte, vol. II. Vienna: Herold, 107–120. 19 Welu, James 1975: Vermeer: His Cartographic Sources. In The Art Bulletin 57, 529–547; Welu, James 1978: The Map in Vermeer’s Art of Painting. In Imago Mundi 30, 9–30. 20 Ripa, Cesare 1970 (1604). Iconologia: ovvero descrittione di diverse imagini cavate dall´ antichità, e di propria inventione. Hildesheim: Olms, Nr. 346. 22 Links, John G. 1982. Canaletto. Oxford: Phaidon, 145–180; Baetjer, Katharina 1989. Canaletto. New York: The Metropolitan Museum of Art, 145–180. 26 Cozens, Alexander 1785/1786. A New Method of Assisting the Invention in Drawing Original Compositions of Landscape; Reprint: Oppé, Adolf Paul 1952. Alexander Cozens and John Robert Cozens. London: Black; Busch, Werner 1993. Das sentimentalische Bild: Die Krise der Kunst im 18. Jahrhundert und die Geburt der Moderne. Munich: Beck, 337–354; Arnheim, Rudolf 1977 (1972). Toward a Psychology of Art. Berkeley: University of California Press; German: Arnheim, Rudolf 1977. Zur Psychologie der Kunst. Cologne: DuMont; Arnheim, Rudolf 1978 (1954). Art and Visual Perception: A Psychology of the Creative Eye. Berkeley, Los Angeles: University of California Press; Arnheim, Rudolf 1978. Kunst und Sehen: Eine Psychologie des schöpferischen Auges. Cologne: DuMont. 27 Ringbom, Sixten, 1970: The Sounding Cosmos. In Acta Academiae Aboensis, Ser. A, Vol. 38. 2. Åbo; Brucher, Günter, 1999. Wassily Kandinsky, Wege zur Abstraktion. Munich: Prestel, 350–372. 28 A thorough dissertation on Eduard Munch with regard to artistic creativity and development from a philosophical point of view and in accordance with recent aesthetics was presented by Kuuva, Sari 2010. Symbol, Munch and Creativity. Metabolism of Visual Symbols. Jyväskylä Studies in Humanities, 139. Jyväskylä: University of Jyväskylä. 29 Kandinsky, Wassily 1952 (1911). Über das Geistige in der Kunst. Bern: Benteli Verlag. 101952. 30 Newman, Barnett 1996. Schriften und Interviews 1952–1970. Ed. Richard Shiff. Bern, Berlin: Gachnang & Springer. 31 Boehm, Gottfried 1995. Bildbeschreibung: Über die Grenzen von Bild und Sprache. In Eds. Gottfried Boehm & Helmut Pfotenhauer. Beschreibungskunst-Kunstbeschreibung. Munich: Fink, 23–40; as for the genesis of the “Gestalt” cf. also Pochat, Götz 2015. Bild/Zeit III. Zeitgestalt und Erzählstruktur in der bildenden Kunst des 16. Jahrhunderts. Vienna, Cologne, Weimar: Böhlau, 20–22. 32 Pochat, Götz 2015. Wolfgang Hollegha: Zum Sehen geboren. In Wolfgang Hollegha, Die Natur ist innen. Exhib. Catalogue, Ed. Günther Holler-Schuster. Graz: Neue Galerie Graz, Universalmuseum Joanneum, 20–31. 34 Pochat 2015, 142. There seems to be a close affinity between the “subjectivity” discussed here and the aesthetics as presented in Susanne Langer´s two major works: Langer, Susanne K. 1942. Philosophy in a New Key. Cambridge: Cambridge University Press; Langer, Susanne K. 1953. Feeling and Form. A Theory of Art Developed from Philosophy in a New Key. New York: Charles Scribner’s Sons. Moreover, the philosophical exposition stands at the threshold of the rising of abstract painting in the USA in the late 1950s in which Hollegha took part. 36 On structure and dynamics in pictorial representations, cf. Gombrich, Ernst H. 1964: Moment and Movement in Art. In Journal of the Warburg and Courtauld Institutes 27, 293–306; Imdahl, Max 1980. Giotto. Arenafresken: Ikonographie, Ikonologie, Ikonik. Munich: Fink; Arnheim, Rudolf 1982. Die Macht der Mitte. Eine Kompositionslehre für die bildende Kunst. Cologne: DuMont. Further references and examples in Pochat, Götz 1996. Bild/Zeit I, Zeitgestalt und Erzählstruktur in der bildenden Kunst von den Anfängen bis zur frühen Neuzeit. Vienna, Cologne, Weimar: Böhlau. 37 Wolf 2007, 44. Structure and dynamics of perception have been dealt with by Arnheim throughout his life; cf. for instance 1983 (1982). Die Macht der Mitte. Eine Kompositionslehre für die bildenden Künste. Cologne: DuMont; earlier discussions on Giotto’s frescoes were revitalized by Max Imdahl in his 1980 book (cf. note 36). 38 Imdahl 1980, 49; Pochat 1996, 249. 40 Bialostocki, Jan 1966. Stil und Ikonographie. Studien zur Kunstwissenschaft II: Die “Rahmenthemen” und die archetypischen Bilder. Dresden: Verlag der Kunst, 111–125. 42 Das Erhabene: Zwischen Grenzerfahrung und Größenwahn. Ed. Christiane Pries. Weinheim: VCH Acta Humaniora, 1989; Pochat 1986, 419–428; 451–452; 513–517. 43 Thomas Aquinas, Summa Theologica, I, qu. I. art. 9, c.
46 Ibid., 144; Meiss, Millard 1945: Light as Form and Symbol. Some Fifteenth-Century Paintings. In Art Bulletin 27, 175–181. 47 Schapiro, Meyer 1945: Muscipula Diaboli. The Symbolism of The Mérode Altarpiece. In Art Bulletin 27, 182 – 187. 48 Châtelet, Albert 1996. Robert Campin, Le Maître de Flémalle: La fascination du quotidien. Antwerp: Fonds Mercator. 49 Robb, David 1936: The Motif of the Christ Child in the Annunciation. In Art Bulletin 18, 523–526. 50 Reuterswärd, Patrik 1998: New Light on Robert Campin. In Konsthistorisk Tidskrift 67, 43–54; Pochat 2004, 130. 51 Hermerén, Göran 1969. Representation and Meaning in the Visual Arts. A Study in the Methodology of Iconography and Iconology. Lund Studies in Philosophy, 1. Lund: Berlingska Boktryckeriet. 52 Graphical illustrations of Hermeréns concepts of referentiality are included in my book on Concepts of Symbols, and later approved of by Hermerén himself: Pochat, Götz 1977. Symbolbegreppet i konstvetenskapen. In Kungl. 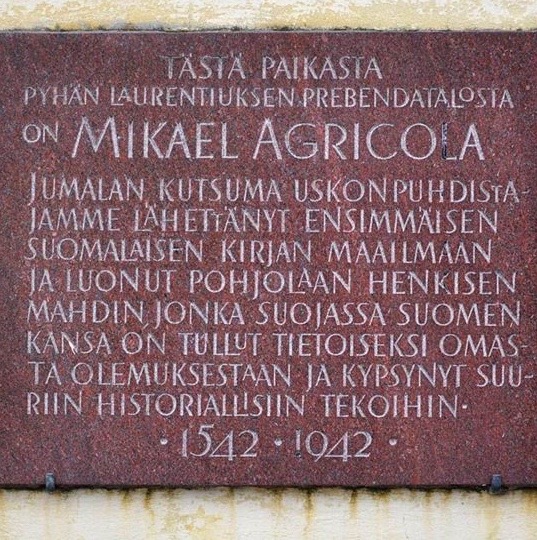 Vitterhets Historie och Antikvitetsakademien, Antikvariska serien, 30. Stockhom: Almqvist&Wiksell; Revised German edition: Pochat, Götz 1983. Göran Hermerén. In Der Symbolbegriff in der Ästhetik und Kunstwissenschaft. Cologne: DuMont, 210–217.